Use this Location Grades form to assign a grade to different attributes to determine the suitability of a potential location for your business. 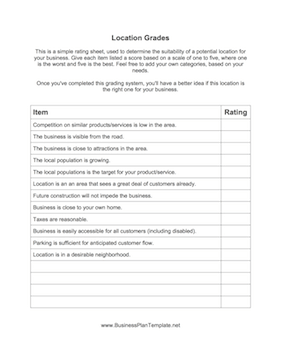 This is a simple rating sheet, used to determine the suitability of a potential location for your business. Give each item listed a score based on a scale of one to five, where one is the worst and five is the best. Feel free to add your own categories, based on your needs. Once you've completed this grading system, you'll have a better idea if this location is the right one for your business. Competition on similar products/services is low in the area. The business is visible from the road. The business is close to attractions in the area. The local population is growing. The local populations is the target for your product/service. Location is an an area that sees a great deal of customers already. Future construction will not impede the business. Business is close to your own home. Business is easily accessible for all customers (including disabled). Parking is sufficient for anticipated customer flow. Location is in a desirable neighborhood.